In the summer of 1942, Jack Kerouac followed in the footsteps of Joseph Conrad and Eugene O'Neill and went to sea. After dropping out of Columbia University the previous Fall, the 20-year-old Kerouac signed up for the merchant marine and shipped out aboard the U.S. Army Transport ship Dorchester. Although World War II had broken out at about the time of his departure from Columbia, Kerouac's motives for going to sea were more personal than patriotic. "My mother is very worried over my having joined the Merchant Marine," Kerouac wrote in his journal at the time, "but I need money for college, I need adventure, of a sort (the real adventure of rotting wharves and seagulls, winey waters and ships, ports, cities, and faces & voices); and I want to study more of the earth, not out of books, but from direct experience." In October of 1942, after completing a voyage to and from an Army command base in Greenland (which he would later write about in Vanity of Duluoz), Kerouac left the merchant marine and returned to Columbia. That was lucky, because most of the Dorchester's crew--more than 600 men--died three months later when the ship was torpedoed by a German U-boat. But the restless Kerouac lasted only a month at Columbia before dropping out again and making plans to return to sea. In December of 1942 he enlisted in the U.S. Naval Reserve. He wanted to join the Naval Air Force, but failed an aptitude test. So on February 26, 1943 he was sent to the Naval Training Station in Newport, Rhode Island. That's apparently when the photograph above was taken of the young Kerouac with his military haircut. It would have been right around the time of his 21st birthday. 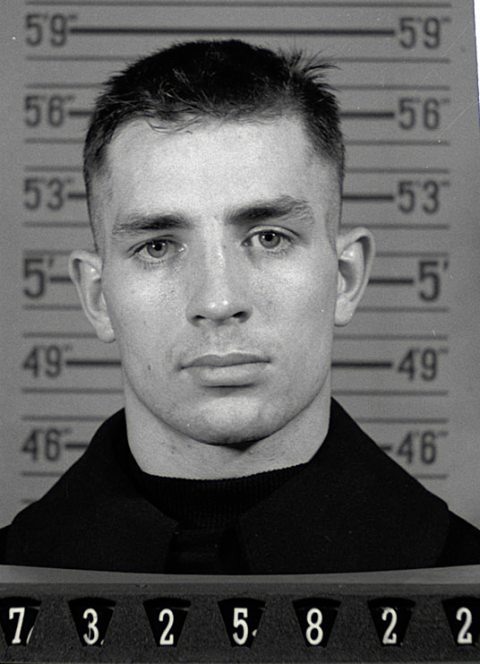 Kerouac lasted only 10 days in boot camp. As Miriam Klieman writes at the National Archives, "The qualities that made On the Road a huge success and Kerouac a powerful storyteller, guide, and literary icon are the same ones that rendered him remarkably unsuitable for the military: independence, creativity, impulsivity, sensuality, and recklessness." According to files released by the government in 2005, Naval doctors at Newport found Kerouac to be "restless, apathetic, seclusive" and determined that he was mentally unfit for service, writing that "neuropsychiatric examination disclosed auditory hallucinations, ideas of reference and suicide, and a rambling, grandiose, philosophical manner." He was sent to the Naval Hospital in Bethesda Maryland and eventually discharged. For more on Kerouac's brief adventure in the Navy, read Kleiman's Article, "Hit the Road, Jack! Kerouac Enlisted in the U.S. Navy But was Found 'Unfit for Service'"
When someone goes to sea, he enters the merchant marine. It’s like entering the legal profession or the media. It’s a civilian occupation. There is no such thing as the U.S. Merchant Marines. The men of the merchant marine were not even recognized as military veterans of WWII until 1988. The “Greenland gap” in the middle of the North Atlantic was an area beyond the protection of air cover, and allied merchant shipping suffered a heavy toll, especially in early 1943. However, on May 6, 43, that all changed. A west-bound convoy approaching Newfoundland went into a fog, and the Germans lost them. But the U.S. had low-freq. radar, and were able to hit the u-boats. Other factors: breaking of the Enigma code, radio tracking (UF-DF), extra fuel capacity on B-24’s. With the German dominance of the North Atlantic broken, the merchant marine began loading up the British Isles, and one year later, the Allies were ready for D-Day. Thanks for the interesting information. And you’re right about it just being “merchant marine.” I’ve made the corrections. Wow, he was so handsome. Beautiful, really. His soulful eyes stare out of that photo. So glad this image has been found and shared. The paragraph where it talks about him being unfit for the military makes me think of the scene from “Big Wednesday” the surf movie where they fake all kinds of stuff to keep from enlisting. An interesting comparison of WWII to Vietnam: In WWII, the Army found many draftees malnourished and unfit for service because of the Depression. Because of that, in the 50’s, the govt. put an emphasis on school lunch programs and physical education. Vietnam-era draftees were in much better shape. Sure, a few wanted to dodge the draft. But they were in pretty good shape, so fleeing to Canada became popular. I know a guy with poor eyesight. When he went for his physical, several guys were faking their eye tests, so they passed everyone, and he got drafted. He stuck it out through basic, and then they discovered he had very poor eyesight. And the records showed he had good vision when he was drafted. He got a disability discharge with a 40 percent pension. He’s lucky he got that, because he’s had a rough life and is severely disabled, but still hanging in there. He looks so young in this picture. Never saw it before. Didn’t we all (once look young). I’ve been following the Beat movies at Sundance this year so this photo of Kerouac is good timing. Good-looking guy. Too bad he drowned himself in alcohol. All true, but the football scholarship to Columbia was a large ommission.